From the moment you are picked up by our VIP valet service (one return valet per booking) and taken to the villa, to enjoying a complimentary bottle of wine, or touring around in our complimentary buggy, you will feel like you have arrived in a special place. Our two storey villa is of the highest standard and has been recently renovated and completely refurbished. It is located on the exclusive North East side of the island near Qualia, away from the hot afternoon sun, and enjoys beautiful sea views overlooking Whisunday Island and the Coral Sea, as well as garden surrounds. It is a perfect place to relax & escape. Enjoy our little bit of paradise whilst sipping on your complimentary bottle of wine. Our villa is ideally suited for three couples wanting a relaxing stay, or family get togethers. With three en-suited bedrooms, and a powder room, it makes for a comfortable stay, and we also have a fold out sofa bed, thus accommodating up to a maximum of eight guests. La Bella Waters has a private pool and outdoor spa for guests only. *Air-conditioning, fans and wire screens on large opening outside sliding doors make your stay very comfortable. * Master bedroom and 2nd bedroom are upstairs, and there is another bedroom downstairs. *Three bedrooms all with ensuites, hairdryers supplied. 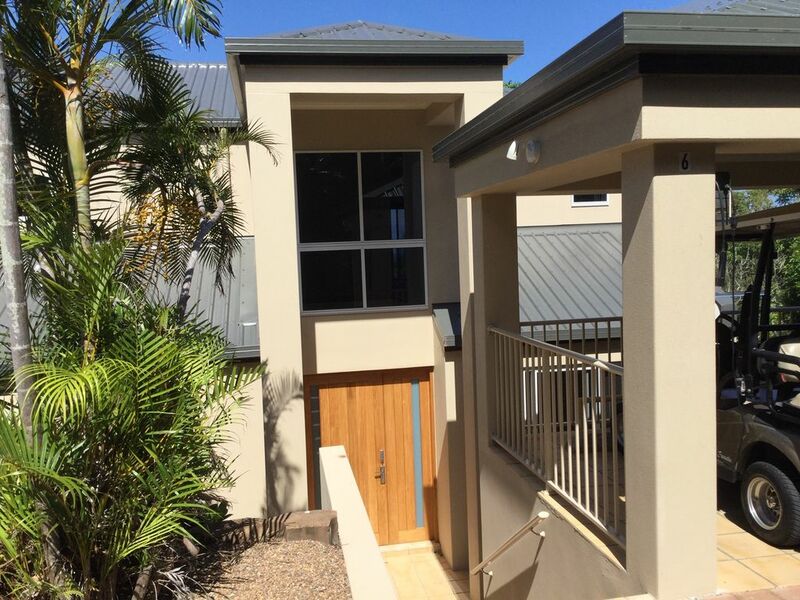 *Relax in the master en suite bath overlooking the sea and Whitsunday Island, you won't want to get out! *Well equipped kitchen with dishwasher & European appliances, washing products, tea, coffee and some basic pantry items are supplied. Enjoy stunning sun rises whilst having your breakfast in the cool of the day. GIVE US A TRY, WE ALWAYS EXCEED OUR GUESTS EXPECTATIONS. ALL WHO STAY LOVE IT! The photos never do the villa justice. You will love the space, and ambience, being close to nature, and coming back to our little piece of paradise after a day out and about. "Thank you for letting us share in your piece of paradise. I had the best week of my life. The villa! The view! The island! Sensational!" Peter. "Thank you so much. The island was amazing as well as this house!" Laura. We love the sea views, garden surrounds, fresh island air, warmth and birdlife. It is a perfect place to relax in and feels like our little piece of paradise and second home. It is spacious and very comfortable, and we like to make it feel like it is home away from home. We are away from the busy side of the island but close enough that we can walk everywhere, albiet a hilly one, or jump in our buggy and be around five minutes from the beach, restaurants, walks.The photos do not do the villa justice as the ambience is what makes our villa so lovely to be in. It is the perfect contrast to our very busy city life. Enjoy a soak in the freestanding master en suite bath, whilst enjoying the sea and Whitsunday island views, bliss! The resort area is there for you to enjoy. Catseye Beach to hire water sport equipment, or laze around the resort pools. Fun activities on offer, visit the Resort Desk for the weekly program. HI marina area offers a selection of restaurants, take aways, and bakery. Also boutiques, a chemist shop & post office. IGA & the bottle shop are located at the southern end, over the ramp. Enjoy glorious water and Whitsunday Island views, as well as garden surrounds. Limited wifi available. Note, island wifi is very sporadic. We try and have a few basics for you to use. Fully equipped to cater for eight guests. There is an indoor dining table for eight, and also an ourdoor dining table for eight. Take your pick depending on the weather or your mood! Three TVs: one in living area, one in downstairs bedroom, one in master bedroom. DVDs provided. DVD store in Resort area to hire DVDs. An outdoor dining table for eight, and four lounge chairs in the patio area. Overlooking sea views and gardens. Magical! Hamilton Island Golf Club on Dent Island, a short ferry ride away. Fantastic course, with beautiful views. Four night minimum stay. Prefer 6 guests. The villa shares a pool with the other seven villas. It is usually very quiet. Please no glass or alcohol at the pool. Do not take any items from our villa up to the pool. You are welcome to use the Resort facilities.The pools are free to use, and you can pick up a program on the weeks activities at the Resort desk, many of which are free. The following activities incur a cost but are available to you: Catseye Beach snorkelling, sailing, stand up board and kayaks. Also, fitness centre with gym & tennis courts, & bowling alley nearby. Enjoy a challenging game of golf on picturesque Dent Is, or lunch there and have a buggy ride around the course. Over the back there are quad bikes, go-karts, rifle range and golf driving range. Massages at Spa Wumurdaylin for a treat. For a Zen moment, put on your walking shoes, take water, and walk around the National Park area of the island, it is beautiful and the best part of Hamilton Island! Download the Hamilton Island app, it is all things Hamilton Island. We had a lovely time and found the house to be of excellent quality.particulary suppling everything we could possibly need in the house,particularly the kitchen. My overseas family were extremely impressed with the entire experience, particularly the impressive views.Hosts were very accommodating and very well organised. Property was amazing, came with everything you need for your stay on Hamilton, even a little bucket and spade for my 3yr old and a bottle wine for us. We had one tiny issue with the buggy that Kate fixed straight away, it was a pleasure to stay here and will be back. We loved our stay at La Bella Waters 6. More than enough room for our family of 4. Clean and fully stocked with pantry staples. in the decade we have been coming to Hamo and having stayed at 6 other places on the island we can safely say this is the best value for money. There is nothing about this large airy townhouse that is not exemplary. The views are just to die for with nothing in the way between you, your balcony, glass of wine and the Whitsunday islands spread out in front of you. the use of the buggy was brilliant, with Catseye beach and the port, shops a 5 minute buggy ride away. Set up in the area of Qualia, the townhouse is perfectly quiet with loads of birds and butterflies.. is just gorgeous. The townhouse is beautifully appointed, with loads of movies for young and old, tv's and video players in all bedrooms and a kitchen that makes my one at home look like a poor cousin. Kate has been so easy to deal with and has gone out of her way to make myself and teenagers feel very at home. THE PERFECT HOUSE FOR THE PERFECT HOLIDAY. We had a wonderful few days on Hamilton Island. The property was clean and spacious with beautiful views from the bedrooms on the top floor. LBW 6 is locatedin the exclusive North East area of Hamilton Island, near Qualia. It faces away from the hot afternoon sun, and is private and quiet. We are around a 5-10 buggy ride from most places. Wander along Catseye Beach, try the watersports on offer, bowling alley for a wet day, laze around the resort pools,or whizz around the go-cart track or quad bike the fire tracks. Take a picnic and spend time walking around the National Park to secluded beaches, lookouts and grass tree fields. Fishing, diving, snorkelling, island hopping and the reef. Enjoy golf on Dent Island, a challenging course with amazing views, or just enjoy lunch and a buggy tour of the golf course. Massages at Spa Wumurdaylin. Have a sunset drink at One Tree Hill, just up from LBW6, or on the Bommie Deck at the Yacht Club, a perfect way to finish your day. Or just sit back at La Bella Waters 6, with a book and a cool drink and enjoy the surroundings, sea air and serenty! Download the Hamilton Island app for information on activities, restaurants and everything Hamilton Island, it is a very useful guide.